Salah did net Egypt's first goal at a World Cup since 1990. The return of Mohamed Salah from injury couldn't prevent World Cup hosts Russia virtually sealing their place in the last 16 by beating Egypt 3-1 on Tuesday. 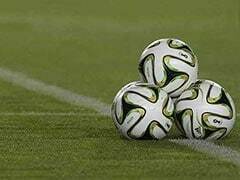 An own goal by Egypt captain Ahmed Fathy opened the floodgates on a sodden night in Saint Petersburg before goals from Denis Cheryshev and Artem Dzyuba furthered Russian hopes they can defy pre-tournament expectations with a deep run into the latter stages. Salah did net Egypt's first goal at a World Cup since 1990 from the penalty spot after he had been hauled down 17 minutes from time, but it was too little, too late for the Pharaohs. Russia will be guaranteed a place in the last 16 and Egypt eliminated unless Saudi Arabia beat Uruguay on Wednesday. 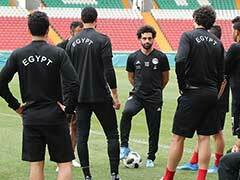 His presence in the starting line-up after sitting out Friday's 1-0 defeat to Uruguay provoked a feverish excitement from the thousands of Egyptian fans that poured into the 65,000-capacity Saint Petersburg stadium to almost even up the numbers in the stands with the hosts. 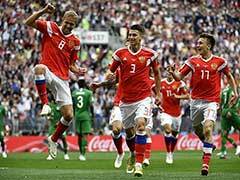 However, Russia had enjoyed a far more positive start in thrashing Saudi Arabia 5-0 to snap a seven-game run without a win heading into the tournament and their greater confidence showed early on. Aleksandr Golovin and Cheryshev were at the heart of most of Russia's best moves against the Saudis and both came close to breaking the deadlock with long-range strikes. Salah looked far from the player who scored 44 goals in his debut season for Liverpool and former Chelsea left-back Yuri Zhirkov wasn't afraid to test his fitness with a series of robust challenges. But Zhirkov's best piece of defending was a last-ditch tackle that prevented Salah a simple tap in at the back post. 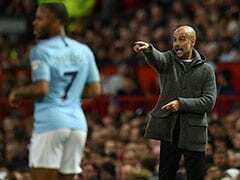 It took 40 minutes for the Premier League's Golden Boot winner to have an attempt on goal as the ball fell kindly on the edge of the area, but even on his favoured left foot his effort curled beyond Igor Akinfeev's far post. Shorn of Salah at his best and facing the hosts, Egypt had an uphill task as it was without gifting Russia the initiative as they did in calamitous fashion at the start of the second-half. There appeared little danger when Roman Zobnin's off-target shot dribbled towards goal, but under pressure from Dzyuba, Fathy threw an outstretched right leg towards the ball and turned it into his own net. Having got the bit of luck they needed, Russia showed they have the quality to trouble more fancied nations with a brilliantly worked second that was swept home by Cheryshev for his third goal of the World Cup from Mario Fernandes's cross. Salah smashed the 10th penalty of the tournament into the roof of the net, but it was little consolation as Russia took a huge step towards the knockout phase of a World Cup for the first time 32 years.